Take the Midland Avenue Exit, heading to Glen Rock (West). After getting onto Midland Avenue get into the left lane because the right lane becomes an exit for 17 South. Continue straight. Go through the stoplight at the intersection of Midland Avenue & Paramus Road. Midland Avenue becomes Grove Street. Follow Grove Street approximately one mile. The synagogue is on the right. Take the Midland Avenue Exit turning right towards Glen Rock (West). Continue straight. Go through the stoplight at the intersection of Midland Avenue & Paramus Road. Midland Avenue becomes Grove Street. Follow Grove Street approximately one mile. The synagogue is on the right. Take the Route 17 North Exit. Follow directions above for Route 17 North. Take Route 4 West to Route 17 North. Follow the directions above for Route 17 North. Continue to the light at Paramus Rd. where you will make a left (if you are coming from Rt. 17 direction). Turn right at the next light, which is Grove Street ). Follow Grove Street approximately one mile. The synagogue is on the right. Take Exit 18 (the last exit) and follow Route 46 West approximately 2 to 3 miles. Take the Route 17 North Exit and follow directions above. Take Exit 163 (Route 17 North exit). Follow directions above for Route 17 North. Take Exit 165 and stay on the access road after leaving the Parkway (called From Road). Go past the Radisson hotel. The access road will dead-end at Midland Ave. Turn right (West towards Glen Rock) onto Midland Avenue. Near Rt. 17, Midland Avenue bends to the left at a stoplight that has a sign that says Mack Rd (to right). You want to turn left at the light to continue on Midland Avenue. Continue straight. Go through the stoplight at the intersection of Midland Avenue & Paramus Road. Midland Avenue becomes Grove Street. Follow Grove Street approximately one mile. The synagogue is on the right. Bus service is also available to Ridgewood bus station at Van Neste Square from both the 42nd Street and the George Washington Bridge New York Port Authority bus stations. Lines that serve Ridgewood include 163, 164 and 175 from Manhattan, as well as 722,746 and 752 in Northern New Jersey. Walk time from the bus will vary based on the route. Taxi service is available from either train and bus stations or by calling 201 494-4444. 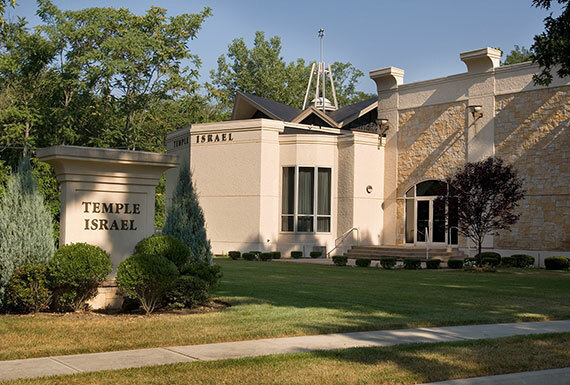 During office hours, please go to the Temple Israel entrance that is on the right corner of the building as you look from the parking lot.